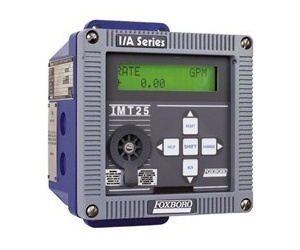 The Foxboro® brand Model IMT25 Intelligent Magnetic Flow Transmitter uses a pulsed dc technique to excite the Models 8000A, 8300, 9100A, 9200A, 9300A, and 2800 Magnetic Flowtube coils, and convert the low level signal voltage to a digital, 4 to 20 mA, or pulse output. Digital precision, stability, and resolution ensure top measurement performance. Remote configuration using PC-based configurator or HART Communicator. Local configuration using optional integral keypad, with backlighted, 2-line, LCD display. Scaled pulse or frequency output. Analog output programmable for unidirectional, bidirectional, or multiple input range. Relay outputs with programmable functionality for alarms. Contact inputs with programmable functionality for remote operation. Automatic and manual zero lock. Software configuration and totals protected in nonvolatile memory in the event of power loss. Compact single or dual compartment. Enclosure meets NEMA 4X and IEC IP66. Field test mode using Foxboro Model IMTSIM Magnetic Flowtube Simulator. Foxboro IMT23 Transmitter Operation, Configuration, and Calibration from Mead O'Brien, Inc.
What are Magnetic Flowmeters and How Do They Work? Crucial aspects of process control include the ability to accurately determine qualities and quantities of materials. 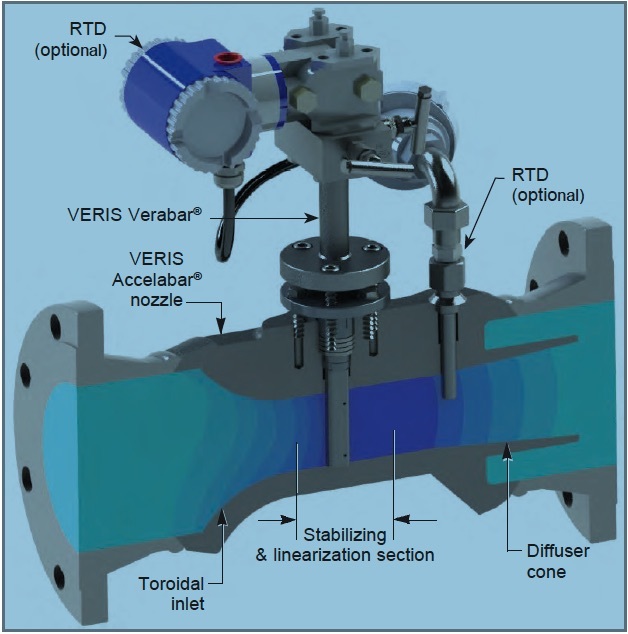 In terms of appraising and working with fluids (such as liquids, steam, and gases) the flowmeter is a staple tool, with the simple goal of expressing the delivery of a subject fluid in a quantified manner. Measurement of media flow velocity can be used, along with other conditions, to determine volumetric or mass flow. The magnetic flowmeter, also called a magmeter, is one of several technologies used to measure fluid flow. 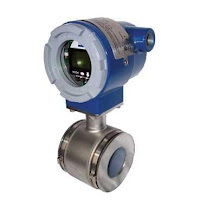 In general, magnetic flowmeters are sturdy, reliable devices able to withstand hazardous environments while returning precise measurements to operators of a wide variety of processes. The magnetic flowmeter has no moving parts. The operational principle of the device is powered by Faraday's Law, a fundamental scientific understanding which states that a voltage will be induced across any conductor moving at a right angle through a magnetic field, with the voltage being proportional to the velocity of the conductor. The principle allows for an inherently hard-to-measure quality of a substance to be expressed via the magmeter. In a magmeter application, the meter produces the magnetic field referred to in Faraday's Law. The conductor is the fluid. The actual measurement of a magnetic flowmeter is the induced voltage corresponding to fluid velocity. This can be used to determine volumetric flow and mass flow when combined with other measurements. The magnetic flowmeter technology is not impacted by temperature, pressure, or density of the subject fluid. It is however, necessary to fill the entire cross section of the pipe in order to derive useful volumetric flow measurements. Faraday's Law relies on conductivity, so the fluid being measured has to be electrically conductive. Many hydrocarbons are not sufficiently conductive for a flow measurement using this method, nor are gases. Magmeters apply Faraday's law by using two charged magnetic coils; fluid passes through the magnetic field produced by the coils. A precise measurement of the voltage generated in the fluid will be proportional to fluid velocity. The relationship between voltage and flow is theoretically a linear expression, yet some outside factors may present barriers and complications in the interaction of the instrument with the subject fluid. These complications include a higher amount of voltage in the liquid being processed, and coupling issues between the signal circuit, power source, and/or connective leads of both an inductive and capacitive nature. 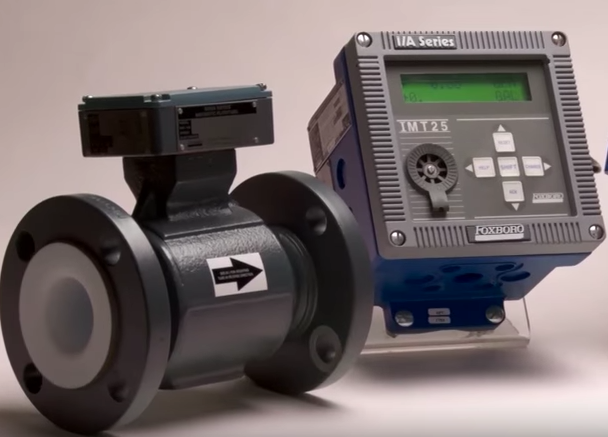 In addition to salient factors such as price, accuracy, ease of use, and the size-scale of the flowmeter in relation to the fluid system, there are multiple reasons why magmeters are the unit of choice for certain applications. They are resistant to corrosion, and can provide accurate measurement of dirty fluids ñ making them suitable for wastewater measurement. As mentioned, there are no moving parts in a magmeter, keeping maintenance to a minimum. Power requirements are also low. Instruments are available in a wide range of configurations, sizes, and construction materials to accommodate various process installation requirements. As with all process measurement instruments, proper selection, configuration, and installation are the real keys to a successful project. Share your flow measurement challenges of all types with a process measurement specialist, combining your process knowledge with their product application expertise to develop an effective solution.